March 29, 2019, New Delhi: On Feb 26, 2019, the Government of India via DPIIT unveiled a draft of the policy that would govern the working of ecommerce sector in India and sought inputs from public. The last date to submit inputs was originally March 9, 2019 and extended to today basis industry request. The draft policy has an extensive data section with its application to businesses in not just the ecommerce space but also social media, cloud computing and technology. 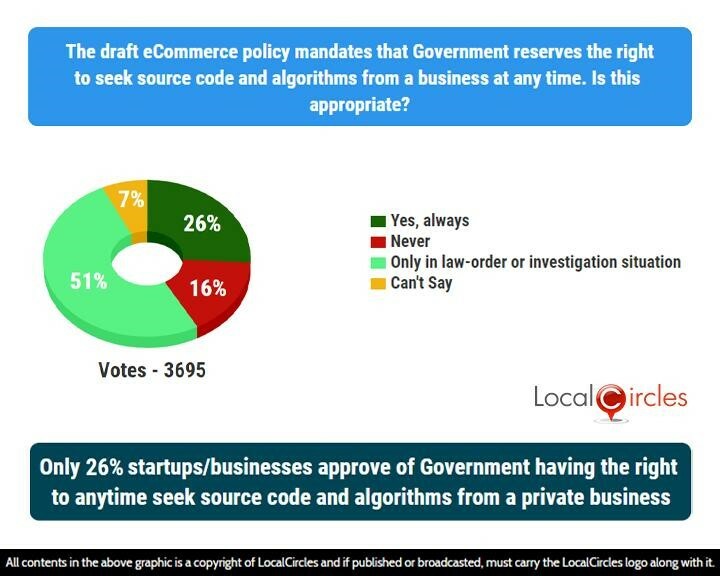 Startups and SMEs have actively been discussing the proposed data in ecommerce policy rules in the LocalCircles business circles in the last 4 weeks and have given many inputs so far. 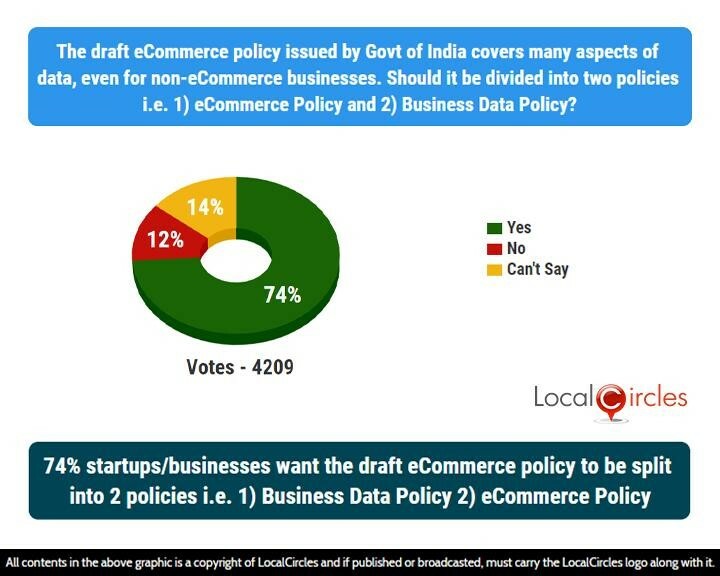 To quantify the pulse of startups, businesses as well as citizens, LocalCircles initiated a 5-point survey and assess what businesses and citizens feel about the draft DPIIT ecommerce policy. The survey received over 15,000 responses from more than 6,000 unique startups and SMEs, and over 6,500 votes were received from common citizens. This document provides a summary of the key insights from the survey. The draft ecommerce policy issued by Government of India covers many aspects of data, even for non-ecommerce businesses. In the first question, businesses were asked if it should be divided into two policies i.e. an eCommerce Policy and a Business Data Policy. 74% agreed with it while 12% did not agree with it. 14% were unsure. According to startups and businesses, the business data policy should not cover just ecommerce, social media, computing and technology businesses but every business that possibly touches citizen data in any way. This should also include physical retailers, banks, telecom companies, airlines, automobile companies and every industry that interfaces with consumers directly or indirectly. The draft policy mandates that Government of India can ask a private business to share any aggregated data, any time. In response to this poll, 29% businesses responded by saying that this was completely appropriate while 14% said this should never happen. A large 53% businesses said that it should only happen in a situation which concerns law & order, or investigation. 6% respondents did not have an opinion. The draft policy also calls data a national resource and claims that any access to this data by non-Indian entities should be guarded in national interest by the government on the behalf of the citizens. The draft ecommerce policy mandates that Government reserves the right to seek source code and algorithms from a business at any time. When asked if this was appropriate, 26% businesses said yes and 16% said no. 51% said it was okay only in case of an investigation or a law & order situation. 7% businesses did not have an opinion. Businesses invest a lot of time, manpower and millions of dollars in developing their source codes and algorithms which help them to be ahead of their competitors. They hence feel that the Government reserving the absolute power on this matter with them is unfair and should not be done. The draft ecommerce policy mandates that any business cannot share their aggregated data with overseas entities including group companies. 53% businesses in response to a poll on this said that this will not act as a limitation to their working, while 29% said this will negatively impact them. 18% businesses did not have an opinion. Many businesses route the user data to their group companies based in various geographies for better analysis or product improvement and features development and such a rule according to them would highly limit their ability to use global talent to improve their products and services in India. Some startups have also shared a concern about this rule becoming a serious limitation when raising an investment or an acquisition/merger by a foreign company. The draft ecommerce policy has stated that businesses must make aggregated data of citizens available to Government on request. 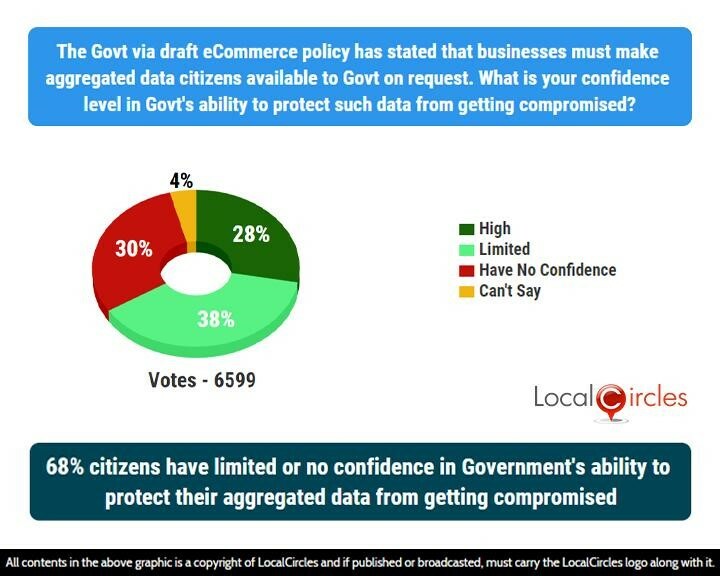 A question asked citizens what their confidence level was in Government’s ability is, to protect such data from getting compromised. 38% said they had limited confidence while 28% said they have high confidence in the Government. 30% said they had no confidence at all in Government’s capability in protecting their data. Approximately 6500 citizens participated in this particular poll. Cases of Aadhaar data leakage have been heard in plenty. In 2017, the CIS report stated that Aadhaar data of 130 million Indians was leaked from Government websites. According to another report, WikiLeaks last year shared that CIA might have access to the entire Aadhaar database as well. Such incidents have lowered the trust of citizens in the Government’s ability to protect their private data, prompting them to take the decision in their own hands, and wanting to make a choice about their personal data themselves. LocalCircles has shared the above findings with DPIIT. 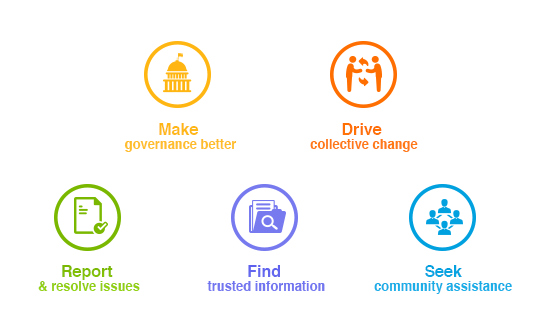 Based on the discussions so far, LocalCircles is optimistic that the each one of the issues outlined in this survey will be given due consideration and incorporated in the final policy as fit. It is committed to working with DPIIT in this area of aggregate data handling by businesses so the business data policy encourages growth of Indian startups and businesses.